As for Intel, they plan on launching an updated Core i5. It will be a high end dual-core Core i5-680 and will replace the existing Core i5-670. The 32nm CPU will sell for for $284. They also have a 45nm low-voltage Core i7-870s, that has a power consumption of 82W and a price tag of $560. 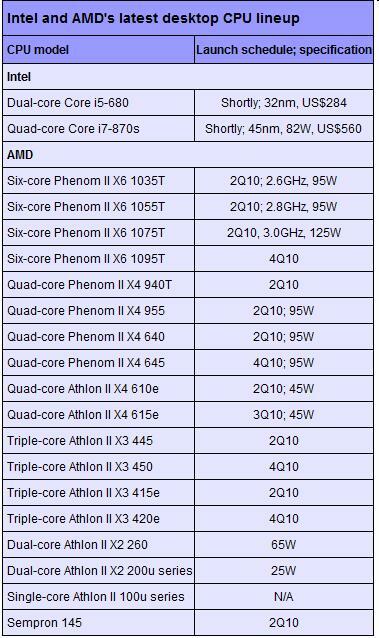 The AMD processors have yet to be priced and have no exact release date, but it looks as if the majority will be released in 2Q of 2010, with a few launching in 4Q of 2010. Below is a chart compiled by Digitimes that outlines all the models.